the unindicted–at least so far. Image from Liberal America. A group in Germany has crossed the Rubicon and formally filed a criminal complaint against the architects of the Bush Torture program: The European Center for Constitutional and Human Rights has filed a criminal complaint against U.S. torture program architects and members of the Bush Administration. The charges follow the long-delayed release of the Senate Report on Torture, which revealed an active torture program (contrary to previous claims) that was encouraged by members of the Bush administration. The Obama administration has done what it can to obstruct attempts to investigate torture under the Bush administration and to shield CIA operatives from prosecution. One of the revelations of the Manning Wikileaks files is information that the Obama administration leaned on Spain and other NATO allies to scuttle possible war crimes indictments. Obama has also shielded CIA operatives from prosecution. for those of you who follow this blog, it was not news that W was being accused of war crimes. I had reported about the Malaysian show-trial of W for war-crimes here back in October 2012. When the revelations about the torture program were initially circulated in 2009-2010, Europeans were much more interested in keeping NATO going. Now not so much. There’s no great support for American saber rattling over Ukraine, and nobody trusts the US motivation in Syria. The work for a conviction on charges of fomenting the use of torture has already happened. The aforementioned show-trial in Malaysia established the guilt of the Bush administration. There is ample information (provided by the Senate) to see that the crazies and Conspiracy theorists (one of them me) were right. It should be noted that the torture tactic of water-boarding was a violation of US law as well, something we put Japanese to death for after WWII. The Reagan administration even filed federal charges and prosecuted when a Texas sheriff was caught waterboarding suspects. I’ve previously written about this, but it bears repeating: the war crimes being stacked up on Bush are all based on breaking of international law with regard to torture. But this was not the crime defined at Nuremberg as the ultimate crime against humanity–the one that put the Nazi leadership in the gallows. The ultimate war crime is the CRIME AGAINST PEACE– fomenting of a war of aggression. Hitler’s wanton disregard for international law in launching his attack on Poland (though he tried to disguise his aggression by cooking up a false-flag attack on Germans by the Poles) was the show-stopper. Based on the statements of Bush terrorism adviser Richard Clarke, W was pushing for an invasion of Iraq within weeks of his inauguration. Clarke believes Bush and company should be tried for this crime, which carries more weight than a charge on torture. 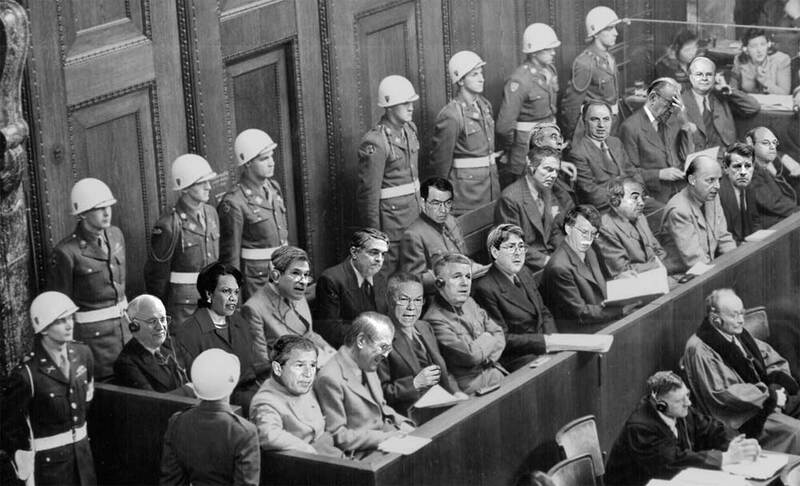 I would want to see charges for fomenting the Iraq war–the cooked ‘evidence’ on chemical weapons, the untrue allegations of an operational connection between Saddam and Al Qaeda prior to 9/11, and other lies promulgated by the W gang. By the way, if such charges were filed, Colin Powell would be in the docks for helping spread the WMD lie in his UN presentation. But it won’t happen. And I’d prefer to see the torture charges brought by Congress, but that won’t happen either–there were Democrats who were briefed on torture (Congresswoman Nancy Pelosi was briefed in ’02) and apparently signed off on the tactic. Even when the Dems were in charge of the House, there was no desire to kick that particular beehive. And remember–Hillary Clinton has never characterized her vote for military action against Iraq as a mistake. It’s hard to know where this indictment goes from here. The US is not a party to the International Criminal Court, and W ‘unsigned’ the Rome statute in 2002 and threatened military force if US nationals were held at the Hague for crimes against humanity as defined by the ICC. This occurred even though the US insisted on helping to write the statutes and guide the implementation of the court. The US went ballistic when Palestine asked for ICC jurisdiction over Israel’s destruction of Gaza. The US refused to recognize the jurisdiction of the International Court Of Justice when it ruled that the Reagan Administration had violated international law when it supported the Contra war against Nicaragua. On the other hand, the European Parliament might be willing to adjudicate the case (anti-American sentiment is running fairly high these days). And there’s always the possibility that another ‘friendly’ government may take up the cause of prosecuting Bush and company. London’s mayor Boris Johnson warned W that his jet had better not touch the ground in London if he wanted to see another Texas Sunrise. Johnson’s threat carries considerable weight because the British actually arrested former Chilean dictator Agusto Pinochet, who’d counted on his friendly relations with former PM Maggie Thatcher to keep him from being extradited back to Chile. From Oil Empire US–there’s also a list of International Laws at their site.